Irony sets in. 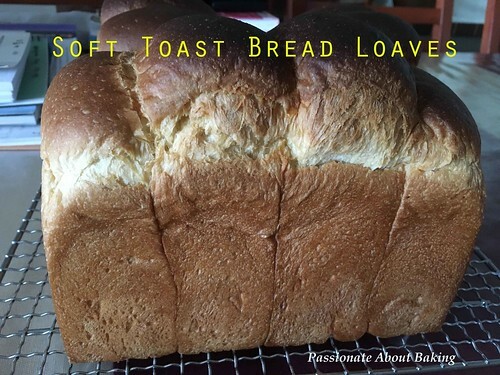 After taking the time and effort to learn about Artisan breads, where long fermentation is required to produce a flavourful and healthier bread, now I prefer to bake easy sweet dough breads. 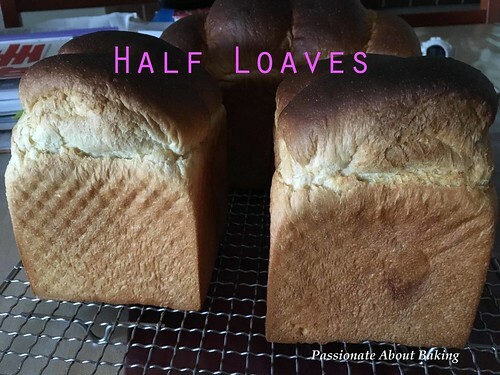 On Sunday where I decided to bake an easy and fast bread loaves, I came across Victoria Bakes' post on this "Killer Toast" with just one proofing. This was the perfect recipe given the time I can spare in the morning. 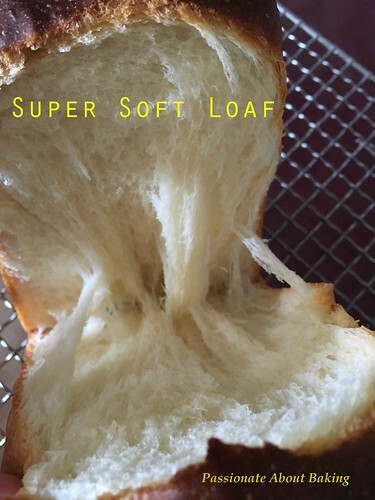 I agree that this was really a very soft bread when it's mixed till the window pane stage. This is a keeper for me. Please read her notes on the hydration which is really useful. 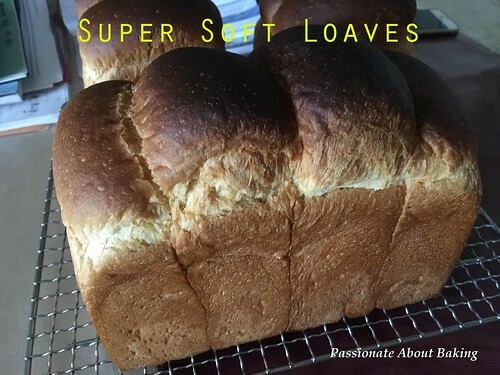 Recipe for Super Soft Bread loaves, adapted from Victoria Bakes. 1. Mix all ingredients, except butter, together and knead till you get a silky and elastic dough. Approximately 4 mins on low speed. 2. Incorporate butter and knead till window pane stage (crucial). Approximately 8mins on medium-high speed for me. 3. Divide the dough into 8 portions, weighing about 127g each. Then roll out flat and roll up like swiss roll, and place into greased loaf pan (or non-stick). 4 portions into regular loaf pan, and 2 each into the half pan. 4. Let it rise till dough reaches 90% of height of pan, approximately 50-60mins. 5. At 50mins' time, pre-heat oven to 170C. 6. Bake in the lowest rack for 30mins, tenting the bread with foil if it browns too quickly. Where I tent it after 13mins, and continue baking it. I used 100g eggs with 80g whipping cream and topped up to 340g liquid with the full cream milk. However, upon mixing, the initial dough was not incorporated, meaning, more liquid is required. I added another 20g of milk, therefore, the dough became wet. After I divided the dough, I rounded it up lightly and started to roll the out flat. The dough was still a little wet. So I floured the worktop lightly to prevent the dough from sticking to the counter top. Then it was easier to roll. The window pane stage took longer than other recipe to reach. 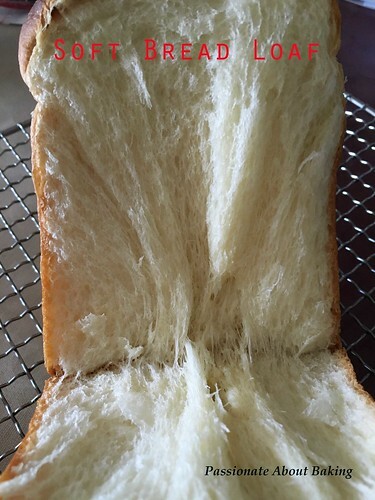 But it does produce a really soft bread with visible streaks. The usual request for my elder sister's birthday cake is - flourless. She is a very health conscious person. Therefore, if she could avoid flour, she will. 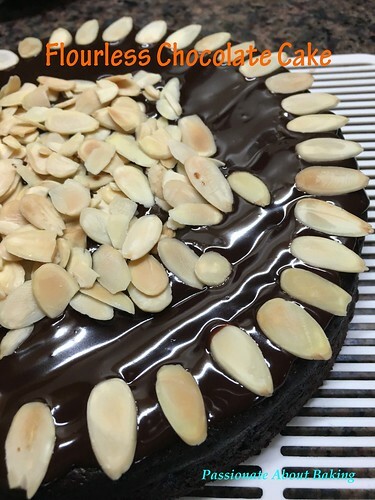 I made various flourless cakes for her, this year's flourless chocolate cake was from King Arthur Flour website. It was easy to make, but it's actually pretty flat if based on the pan size provided. 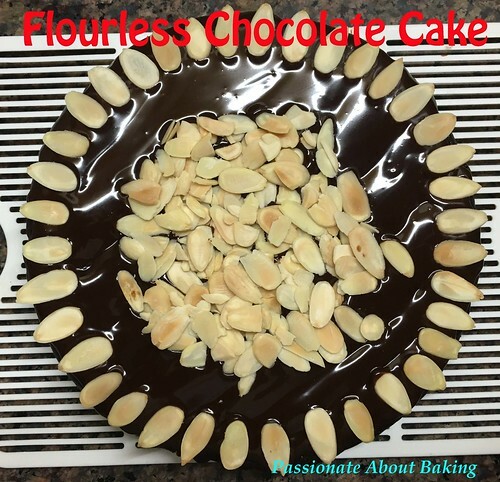 Recipe for Flourless Chocolate Cake, adapted from King Arthur Flour. 1. Preheat the oven to 160°C. 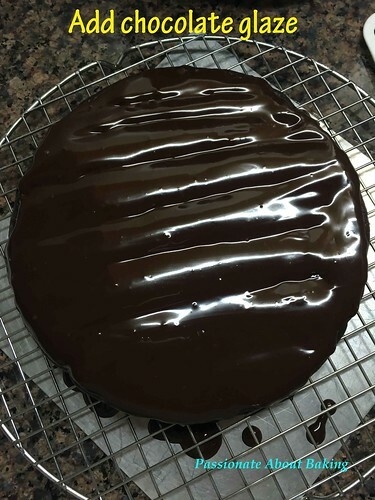 Line an 8" round cake pan. 2. To make the cake: Put the chocolate and butter in a heat-proof bowl and simmer it over boiling water. 3. Heat and stir till butter and chocolate has melted. Remove from the heat immediately and let it cool down slightly. 4. Stir in the sugar, salt, coffee powder and rum. 5. Ensure that the mixture is not very hot before adding the eggs. Add one by one and mix until smooth. Add the cocoa powder, and mix just to combine. 6. Spoon the batter into the prepared pan. 7. Bake the cake for 25 mins or until a skewer inserted into the centre comes out with very slight crumbs. 8. Remove it from the oven, and cool it in the pan for 10mins. 9. 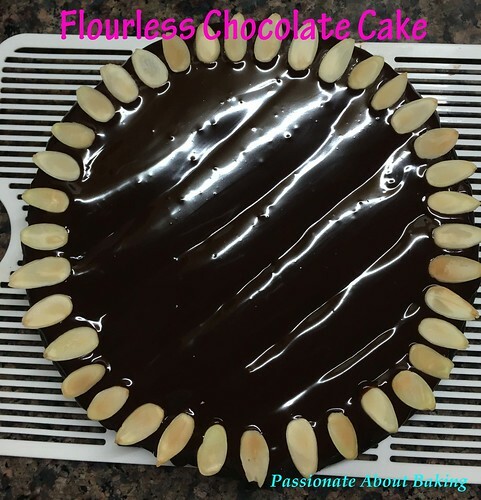 Loosen the edges of the pan and turn it out into a wire rack to allow the cake to cool completely before glazing. 10. To make the glaze: Heat cream in a heat proof bowl over simmering water. On a separate bowl, place the chocolates. 11. Remove the cream from the heat when it's hot, and pour into the bowl of chocolates. Let it rest for 1 min. 12. Stir until the chocolate melts and the mixture is completely smooth. 13. Spoon the glaze over the cake, spreading it to drip over the sides a bit. 14. 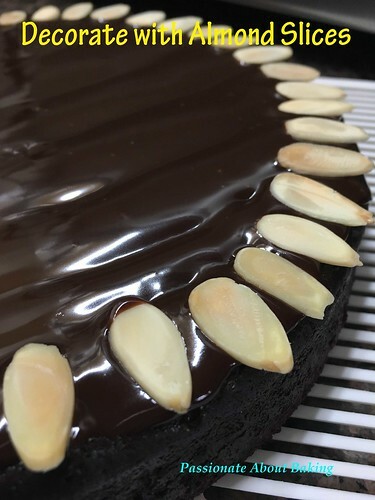 Decorate the cake with the toasted almond slices. Refrigerate. 15. 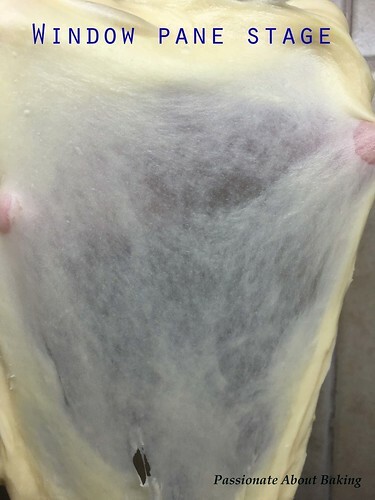 Before serving, bring it to room temperature. 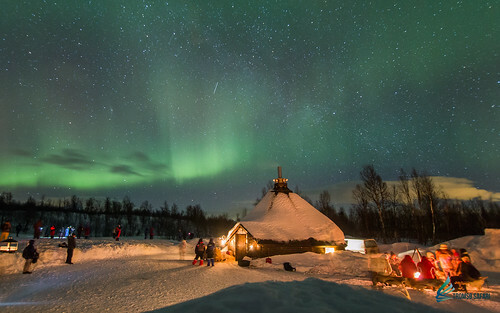 For 2016, I hope I can go for more holidays, and also spend more quality time with my children. As they moved on to secondary schools, their time spent at home will be lesser as school activities picked up. I hope this new year will be smooth-sailing and fruitful too! For the last day of 2015, my colleagues organised a mini department breakfast party. As part of my contribution, I baked muffins. 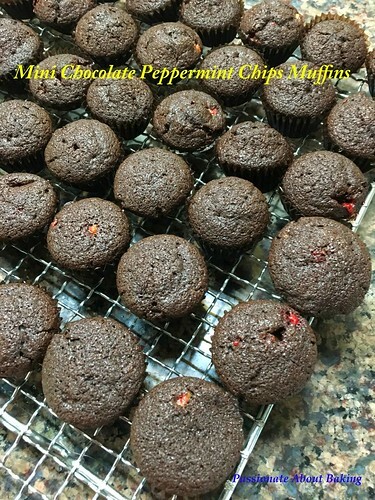 Recipe for Chocolate Peppermint Chips Muffins, adapted from Tested & Tasted. 1. Combine and mix all the wet ingredients in a bowl. 2. Sift the flour and powder, and combine all dry ingredients and mix. 3. Pour the wet ingredients into dry ingredients and stir till just combined. Batter will be lumpy. 4. 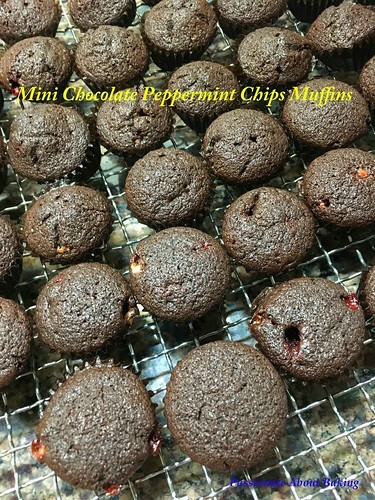 Add in peppermint chips and mix to corporate. 5. Scoop into paper cups. 6. Bake at preheat oven of 170C for 13mins or until a skewer inserted into the muffin comes out clean.